Gotta say impressed so far. Easiest break in I've ever had and super comfortable. More comfortable than the Redwings I've had. Not a bad lower cost boot. Some of my brothers wear them and like them. I've always worn redwings. My last pair, which are slip ons have been my favorite. That being said, I've actually started wearing keens mid tops, and I'll never go back. The amount of comfort these offer is amazing. An I can buy my steel toe leather pair I like for $100. Whole lot cheaper than my redwings ever were. I'm a Redwing fan myself. Never heard of Thorogood. Regardless, a good pair of work boots is a good pair of work boots. Before I retired I used to buy Wolverine boots. They were very comfortable but after about a year the soles would split on them and had to be replaced even if they were in good shape otherwise. I finally switched to Timberland. Also very comfortable and held up better. Wore a couple of pair of Danner Acadia boots (insulated & uninsulated) on the job for many years. It was all about the 'spit shine'. I have used Wolverine boots for years. The first pair was the best , the pair I have now is the worst, they are the least comfortable, and already wearing on the heels pretty bad , and they arent even 8 months old yet. Quality seems to be dropping. Seems a lot of manufacturers are outsourcing to China and the quality definitely reflects it. Thorogood are made in USA in a union shop. Usually with American products if it wasn't made Monday morning or Friday afternoon you are good to go. @TnRiver46, these would be good for you down at the lake house. Especially the way you do construction... ... Which I admire BTW! You might try using mink oil on your boots. 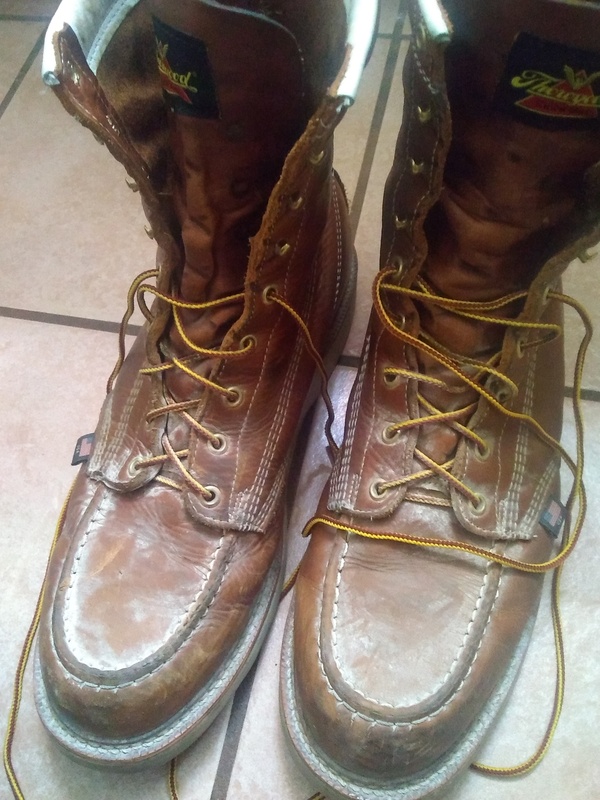 It will waterproof them.If I remember right I believe it was made by Red Wing. It has helped several pairs of boots I had. OMG! So what now, back to the sandals?! ?